Now is a wonderful time to be excited about food. Like the 1980’s haut couture restaurant boom, this is a time of interest and wonder about the food we eat. The difference today is that people are less concerned about the type of restaurant cooking their food, as they are concerned about who and where the food is being grown and raised. A plate of humble beets can be the hit of a dinner party if the host can mention the farm down the road where they were grown. Yet while it’s a great time to be excited about eating food, there’s not always a shared sense of excitement from the people who grow our food. Drought producing a terrible 2012 hay harvest, rising grain prices, devaluation of land from hydraulic fracturing; all these have put a treble of worry into the voices of many farmers and cheese makers I’ve spoken with over the past two seasons. That worry had crept over into my mind as well, at least until visiting with Oliver and Jodi Griswold at North Woods Ranch. Oliver and Jodi have an excitement about farming and raising animals that’s evident five minutes into meeting them. 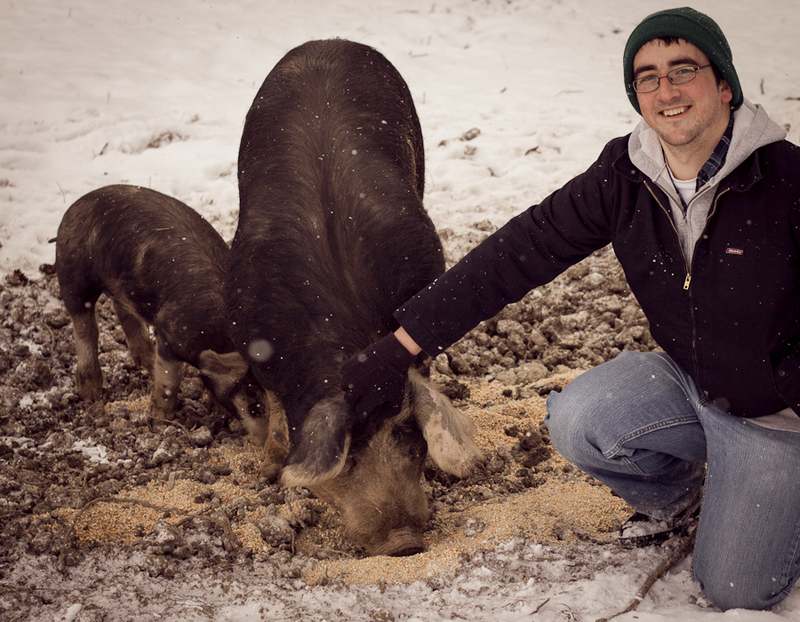 After spending the better part of an hour with them among their Berkshire hogs in 19 F weather, I was convinced Oliver may be the most enthusiastic and self-motivated farmer I’ve ever met. Last weekend, Carla and I visited her parents, which is only five minutes down the road from North Woods Ranch. In a funny twist of the story, North Woods Ranch shouldn’t exist. The land was slated for construction of a 52 house development in the 1990’s. Before that could happen, the land was then purchased by a private individual, and saved from development. Now its 180 acres feature the Griswold’s Scottish Highland Beef and Berkshire pigs among the rolling hills and sparse woods. You’d never think we were just 30 miles outside of Pittsburgh. In speaking to Oliver, I came away with the notion that he was less of a farmer and more a steward of the land. The basic premise of the farm is to take care of the soil, which will in turn provide for the animals. A concept that kept coming up in our talk is “what can we do on the farm, with what we already have.” Oliver, a former engineer, approaches the problems of the farm with a very scientific approach. Everything on the land is scrutinized for dual-uses and extending their value. Even the animals. Oliver explained that he was happy to have located high quality, non-GMO feed from a mill in Ohio, but he wanted to try and have the land produce as much food as possible for the animals. In a very clever, multi-tiered variant of rotational grazing, Oliver is looking to sow a range of turnips, chard, and rutabagas into the land this coming spring. Then the cows will graze off the greens of the plants and fertilize the field. 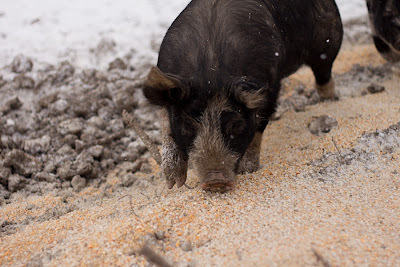 Once they’re finished, the pigs will move to that field and root up the turnip bulbs and various roots, with their pointed hooves and shovel-like noses working and aerating the soil. Over the course of our conversation, I was amazed; these were concepts I had read about in practice, but here was someone actually doing them. In Pennsylvania. In the dead of winter. And it was working! 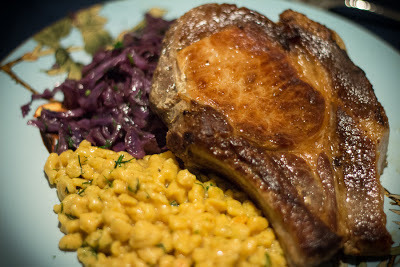 Of course, the proof is always on the plate, and I was very excited to purchase some of North Wood’s pastured pork. Their pigs are big, beautiful animals, snorting happily across the wooded hills, rooting and foraging to their heart’s content. As Oliver said, “we try to make every day a great day for our pigs, with just one bad day at the end.” To his further credit, he’s even tried multiple abattoirs in the area, to find one that treats the animals humanely and can do custom cutting to his customer’s needs. If the health of the land is evident in the health and vitality of the pigs, then it’s also reflected in the meat the pigs produce. The meat is a deep, ruddy red from a lifetime of living and exercising outdoors, with a gentle freckling of intramuscular fat that only comes with slow, unhurried growth. These two pork chops were from a bone-in loin roast that I ended up cutting down. Like a good steak, a good pork chop needs little more than salt and pepper. And this was better than good – it was excellent pork. Served with sweet potato spaetzle and braised red cabbage, it was a delicious warm up after another cold day. I'm very excited to see how things progress on North Woods Ranch, and especially excited to continue to taste the progress! What did you drink with the pork? Would it be good with bourbon? I'm going right now to their website to check out the details. Plus I'm passing on your post to all my pork loving friends. North Woods Ranch -- what a great discovery; and how wonderful it is to "meet" folks like Oliver & Jodi Griswold. That's the great thing about Culinary Pen -- readers get to dig into a subject matter as CP educates, entertains and connects the dots. I like the notion that the health of the land is connected to the health of the meat and food we eat from the land. The description of pork chops from the Berkshire hogs makes my mouth water. Be sure to check out North Woods Ranch website via the hotlink on Culinary Pen. Thanks so much for all your comments! It was a great experience, both in the meeting and the eating! Steve - to answer your question, I usually prefer bourbon before or after a meal. Before if pairing with salty, fatty appetizers, or after dinner when it's something I was looking to enjoy and savor. If you did want to go the bourbon route, I might suggest Woodford Reserve on the high end, or the classic Buffalo Trace for a more everyday bourbon. Otherwise, I am a big fan of brown ales with this type of meal. Sometimes they can be seen as sort of middle of the road, but a good brown ale is incredibly food friendly. The roasted meat matches the toasted, caramel notes in the beer, while the sweetness of the pork plays off the inherent sweetness of the malts. And a modest amount of hops does help to cut the fat of a rich dish, but not to overwhelm with hop bitterness. Thanks! I was thinking about the Elmer T Lee, which is made by Buffalo Trace. It's a single barrel and relatively light and caramel-y. Brown ale sounds good though, too. That's usually a good beer to have with food. Youngjoo - that pork sounds amazing! I would love to try it. I know some farmers will add molasses to the water of pigs for a few days before culling to get some extra sugar in their system. Steve - Ha! I thought about joking that most bourbons are made by Buffalo Trace, even old Pappy Van Winkle.